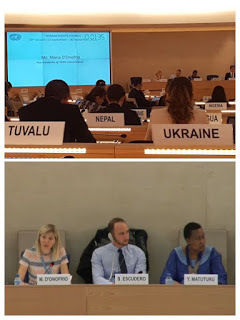 On September 22, 2016, VIDES International Representative Maria D’Onofrio spoke at a panel discussion on youth and human rights that was held during the 33rd session of the Human Rights Council (HRC) in the Palais des Nations in Geneva. The panel discussion was mandated by HRC resolution 32/1 of June 30, 2016 and its objective was to identify challenges, best practices and lessons learned in the exercise of human rights by young people, as well as relevant opportunities for the empowerment of youth in the exercise of their rights. Youth empowerment through human rights was the key theme addressed by Ms. D’Onofrio in her opening statement. She highlighted the importance of access to quality education and effective implementation of children’s rights up to 18 in accordance with the Convention on the Rights of the Child has key conditions to empower youth and to unlock their potential as promoters of human rights. Ensure that youth rights issues remain on the agenda of the Human Rights Council, by requesting a Report by the OHCHR or the Advisory Committeeon the topic. With over 1.2 billion youth in the world, they deserve special attention to their needs and priorities. VIDES International has been advocating to ensure that the rights of youth are given priority in the international agenda. The attention that the HRC is giving to this topic is a major step forward towards promoting youth rights. VIDES welcomes the due attention that is being given to the subject and looks forward to the first session of the UN Forum on Human Rights, Democracy and the Rule of Law whose theme will be “Widening the Democratic Space: the role of youth in public decision-making”. Ms. D’Onofrio was joined by fellow panelists Mr. Simon-Pierre Escudero, Representative of the El Salvadorean NGO, Asociación de Tierra de Jóvenes, and Johanna Nyman, President of the European Youth Forum. Yvonne Matuturu, Head of the Social and Human Sciences Section, UNESCO Multisectoral Regional Office for Central Africa, Cameroon and Virginia Bras Gomes, Member of the Committee on Economic, Social and Cultural Rights were the other speakers of the panel that was moderated by H.E. Ms. Anna Korka, Permanent Representative of Greece to the United Nations Office at Geneva.